Like corn flakes, Cheerios invites the addition of fresh fruit. Fresh bananas and/or strawberries make a good thing even better. But what's the result when the fruit is freeze-dried? Quick and simple, this new cereal is okay. The pieces of freeze-dried fruit are smaller than in other new cereals doing the same thing. I recently reviewed Kellogg's "Corn Flakes With Real Bananas". My main beef with that cereal was that its freeze-dried banana pieces never fully absorbed the milk - leaving the pieces partial crunchy and un-banana-like. Thanks to Cheerios' smaller pieces, the fruit becomes more like what we're used to. In fact, the banana pieces were a little mushy. My only real complaint with this cereal is that the strawberries pieces are a little bit too tart. This cereal is no replacement for Cheerios with fresh fruit. If you have the time and the fruit, that is the better option. If you're choosing between cereals with freeze-dried fruit, Strawberry Banana Berry Burst Cheerios is one of the better options. $3.49 reflects the price of a 13.1 ounce box. What do you think of Strawberry Banana Berry Burst Cheerios? I need this cereal. It's my all time favorite ever. Please bring it back! My fav cereal ever... after all this time, still missing it!!! This was/is my favorite cheerios cereal! I really don't care for the others. I would love to see it back on sale again! Why is the stuff I like always discontinued?!? Best cereal ever, Lack of sales were because they didn't give it a chance to get around. I would work for G.M. and sell this and make a ton of money. Bring it back and give it a chance to get out. I live in Chicago and I really, really, really love strawberry banana berry burst. Please please general mills bring it back. I love this cereal but all the stores in my area stopped carrying it, where can I find it? PLEASE listen to your customers' requests and BRING BACK the strawberry banana cereal. Like the others here, I've missed this cereal and am actually craving it!! I think it is truly one of the few that are UNIQUE of its kind. Instead, we now have Banana Nut, which, eh, is okaaaay, but this flavor is a dime a dozen, unlike the strawberry banana! It seems to me you should have given it more time to get a consumer base before yanking it off the market. PLEASE GIVE IT ANOTHER SHOT. . . IT'S WAY BETTER THAN BANANA NUT!!!! This is my favorite cereal ever, but I can't find it any more. I miss this cereal :( I too wish they would bring it back! I don't understand why this product is not back yet. It was on of the best cereals ever!!!! I'm in Canada. Bought the cereal once and have never seen it again. It was really good and probably the best I've eaten. Bring it back General Foods. OMG! I can't believe this cereal is no longer available!! It was the greatest cereal ever!! Please bring this cereal back.... it is sooooo good! I loved this cereal and I can't believe that they discontinued it. I'm very sad. IS THIS STILL BEING MFG AND WERE IN SAN ANTONIO TEXAS IS IT AVAILABLE OR AVAILABLE IN SOLDOTNA, ALASKA? Please bring back that cereal. Help! I have one more box left, and I can not find it anywhere. 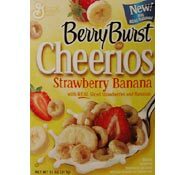 I have not been able to find Strawberry Banana Berry Burst Cheerios in the Plano, Texas area. Did you stop making it? We like it very much. I loved this cereal and it was great for camping. The schools should carry it too. These fruits bought separately are hard to keep fresh so the cereal made life easier for me. Thank you for contacting General Mills. We are sorry you encountered so much difficulty in attempting to find the Berry Burst Strawberry Banana Cheerios cereal you were looking for. Unfortunately, due to lack of sales, this product was discontinued and is no longer available. I love it, but I can't find it either, I have checked what few grocery stores we have and none of them carry it anymore, what's the deal????? Hello. I cannot find the strawberry banana cheerios anymore. Could you tell me where I can get these? Thank you.